The furore about freedom of speech on campus tends to shapeshift – one minute it’s about “no platforming”, then trigger warnings, then bans on books, then the monoculture of lecturers’ views. It’s all underpinned by precious little evidence and the result has been precious little actual action from government or regulators, despite the column inches devoted to it. But there has been one major ministerial intervention on speakers on campus. Back in May, Sam Gyimah hosted a summit on free speech and speakers arguing that the current landscape was “murky” with “numerous pieces of disjointed sector guidance” helping to create a “web of complexity”. His argument was that this was being exploited by those wishing to stifle free speech. He then promised that new guidance would for the first time provide clarity on the rules for both students and universities – the “first government intervention of its kind” since the free speech duty on universities was introduced in 1986. The Equality and Human Rights Commission kindly offered to take a lead on developing the work and it has been working up a draft ever since. The summit came in the wake of the Parliamentary Joint Committee on Human Rights’ inquiry into free speech. Back in December it heard a handful of anecdotes from Spiked! 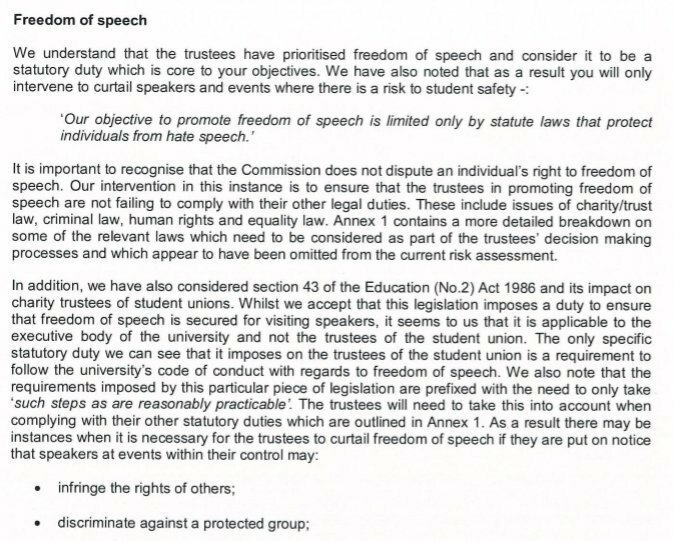 and in January had heard the President at Sussex Students’ Union eloquently argue that it charity law meant that students’ unions and their societies sometimes had to restrict freedom of speech. There then followed an uncomfortable exchange between the committee and a couple of officials from the Charity Commission, and a report calling for the kind of collaborative clarity that Gyimah then promised. The report from EHRC is due any day now, but the Charity Commission has pre-empted its publication, resolving to issue its own revised guidance for charities generally and students’ unions specifically on freedom of speech just days before the wider guidance is due. In a blog up on the site, the commission’s director of legal services accepts that it hasn’t done enough to highlight the centrality of freedom of speech to charities with purposes to advance education (ie students’ unions) and acknowledges that this may have caused difficulty in decision-making for some trustees. Of course, the context is that the commission’s guidance to charities on external speakers is hosted within a toolkit on “protecting charities from abuse for extremist purposes” (code for “watch out for controversial views on Islam”) but has now been “rebalanced” given that students and their unions have had the temerity to define “extreme” all on their own. But there are several devils in the detail for Gyimah. The commission says that freedom of speech is not an absolute right, and doesn’t negate trustees’ duties to “limit the undue risk of harm”. Gyimah has repeatedly said that “safe spaces” shouldn’t be used to silence opinions, but the commission argues that “people should feel safe in a charity’s presence” and is a “basic expectation” that “cannot be ignored”. And it makes clear that trustees have to show that any event is both for the “benefit of their members” and contributes to their purposes – by creating the kind of open, accessible spaces for learning and debate that most students’ union “safe space” policies attempt to secure. Its guidance should “not be used, and is not intended ever to be used, to prohibit those with lawful, albeit unpopular, views”, but Students’ Unions should ensure they are careful “not spread hatred and intolerance in the community”, and be “careful not to be unnecessarily divisive or denigrate faiths, racial or other groups”. Strongly partisan or controversial views “may risk the safety of the charity’s staff and volunteers”, and for that reason, before inviting a speaker, “trustees should assess and manage these risks”. And herein lie the problems. Students’ unions rarely ban speakers. But where a student society invites a celebrity alt-right speaker to campus, it’s not at all clear that a small membership charity should deploy its scant resources on the security that would be needed – after all, a students’ union cannot “allow its funds to be used to support campaigning on an issue that would be outside of its charitable objects”. Given that HEPI research found that there is considerable support for the idea that “students that feel threatened should always have their demands for safety respected”, there are legitimate arguments about whether a charity acting in the interests of students should promote and legitimise the views of those who seek to deny their existence – even if those views are within the law. And given that charity trustees have a duty to consider the reputation of their charity, it’s not at all straightforward to imagine that a students’ union board should allow a free-speech-within-the-law free for all when their own members are loudly protesting about an event or speaker. The relationship between a students’ union’s duties under charity law and its university’s duties under the Education Act 1986 also remain problematic. The Act requires that university governing bodies develop a code which ensures that “reasonable steps” are taken to secure freedom of speech when it comes to students’ unions and their buildings. But the commission has repeatedly said that this must not mean that students’ unions simply defer to their university’s judgement on an event, arguing that they may need themselves to curtail freedom of speech if events in their control infringe the rights of others or discriminate against a protected group. Away from the silly headlines, if students’ unions had been getting their judgments wrong all these years, we would surely have a bank of regulatory intervention case studies from the commission. But we don’t, and in truth students’ union officers and staff have been expertly and deftly navigating these complex and nuanced judgments, tensions and duties for years. Just look at the NUS guidance from 2011 (which was developed with the help of government funding). It sets out both the competing legal duties on freedom of speech and freedom from harm, and a helpful framework for managing risk and balancing competing freedoms that most unions already follow. Students’ unions both can and should place some restrictions even on lawful freedom of speech. Gyimah’s EHRC guidance will need to make this clear if it is to do anything other than add to the complexity and confusion.